Senior representatives of the Presbyterian Church of Taiwan (PCT) flew to England to attend the funeral and thanksgiving service at Zion United Reformed Church in Northallerton for the Rev Dr Boris Anderson (94) on Friday, April 26. They joined many from in and around Aysgarth, Wensleydale, where he had lived for over 30 years. The Rev Jen-Kuei Lo, the Vice Moderator of the General Assembly of the PCT, explained that Dr Anderson had given the best part of his life to Taiwan, spoke beautiful Taiwanese, loved that country more than the Taiwanese did, and firmly believed that Taiwan did not belong to either Japan or China. His tribute was translated by his wife, Li-Ju Lo. Dr Anderson and his wife Clare had been sent as Presbyterian missionaries to Fujian Province in China in 1946 following their marriage in 1945. But they were moved to Taiwan in 1948 at the request of the Rev Dr Shoki Coe who was the principal of the Tainan Theological College and Seminary following its re-opening after the 2nd World War. Dr Anderson became the vice principal and taught New Testament studies. The Rev Lo said they were modern missionaries who refused to live apart from the Taiwanese. They fully supported Dr Coe and Taiwanese self-determination even in times of danger. The present Dean of the college, the Rev Dr Chhong-Fat Chen, said that Dr Anderson had contributed to both the church and society in Taiwan. But as soon as a Taiwanese was academically ready to take over Dr Anderson stepped down and returned with his family to England in 1963 where he became the secretary of the Presbyterian Church’s Overseas Mission Committee. The Rev Ray Adams told the congregation that Dr Anderson had played a key role in defining the way the United Reformed Church related to churches overseas when the Presbyterians and Congregationalists merged in 1972. The Andersons, he said, led the way in showing that missionaries could work under the leadership of nationals, supporting their work whole heartedly, and never being isolated or superior. And as he travelled around the world attending international church meetings Dr Anderson was sympathetic and often prophetic. He was committed to justice and peace, and he and his wife continued to support the Taiwanese in their quest for self-determination. Dr Anderson’s son-in-law, Philip Spencer, commented: “He was a remarkable man. It was a great privilege to talk to him, to listen to him and to learn from him.” The service included poems read by Dr Anderson’s grandchildren, Reuben and Rosa, and tributes from friends in Australia and former students in Taiwan. Then his daughter, Jane, spoke of how he had been born in Hull in August 1918 into the family of a Presbyterian minister. From his father he gained a love for theology but it was from his artistic, well-read mother that he acquired his love for music, literature and art. He learnt to play the flute well and could quote large passages of Shakespeare (and Chaucer). One of the most formative experiences in his life was living in Jarrow at the time of the great march, for his father became the minister to a church there in 1934. He studied at Pembroke College, Oxford, from 1937 to 1940 and then theology at Westminster College at Cambridge. It was at the latter that he met Clare and Dr Coe. His friendship with Dr Coe was strengthened when he was studying Chinese at the School of Oriental and African Studies in London. After Dr Anderson retired he and his wife visited many of the Presbyterian churches and old friends overseas. He was an inspiring preacher and his ministry was much appreciated at Low Row United Reformed Church in Swaledale and at Aysgarth Methodist chapel. The Andersons took part in many village events but as Clare’s health deteriorated he dedicated himself to caring for her. She died in May 2008. His daughter especially thanked those who had helped him during the last few years: the staff and doctors at Aysgarth surgery; his friends in the Wensleydale and chapel communities; and the carers who were with him each day. The Rev Lan Ting Fang, the managing editor of the Taiwan Church Press, attended the service as a representative of the Presbyterian Church of Taiwan and as a reporter. There will be a memorial service for Dr Anderson at Tainan Theological College and Seminary on May 26. The Rev Malcolm Smith officiated at the services at Darlington Crematorium and at the church in Northallerton. Courageous, clever, zany, funny, generous and stylish were all used to describe Clare Anderson at her funeral at Northallerton United Reformed Church on Friday, May 16, 2008. Her bravery was seen not only in how she battled against ill health in the latter part of her life but also in how, as a young woman, she travelled with her husband, the Rev Dr Boris Anderson, to a remote part of China in 1946 and later supported the Taiwanese in their fight for democracy and independence. Those from mid Wensleydale who attended the funeral were fascinated to hear about her life before she and her husband retired to Aysgarth in 1983.They heard Ms Yuehwen Lu, the representative of the Presbyterian Church of Taiwan, thank those in England who had sent such wonderful, dedicated missionaries to her country. Mrs Anderson was born in Angel, Islington in June 1923. Her father was a Presbyterian minister and his family moved with him to Chalfont St Giles, Nottingham and then to Birmingham. During the 2nd World War while she was studying Classics at Newnham College, Cambridge, one of her brothers was serving with the Friends Ambulance Unit in China. She first met Dr Anderson while at Newnham College and they married in 1945. Dr Anderson had been studying Chinese in preparation for work as a Presbyterian missionary to Fujian Province in China. It took them a year to find single berths on a troop ship. After two years in China they were transferred to Taiwan where Dr Anderson was appointed vice principal of the recently re-opened Tainan Theological College and Seminary. While Dr Anderson lectured on New Testament theology Mrs Anderson taught New Testament Greek and Shakespearian poetry. This led to an invitation for her to lecture in Greek and Latin classics at Cheng-Kung University. Taiwan at that time was a virtual police state under the KMT government and Mrs Anderson knew there were political spies in her classes. In Taiwan she is now famous for having courageously gone ahead with lectures on Sophocles’ Antigone with its message about the rights of an individual in a totalitarian state. She also became famous for how she, with others, made sure that the truth about the “Formosa Incident” in 1979 was widely reported. She published a small book under a pseudonym in support of the democracy and independence movements in Taiwan and the release of political prisoners. By then the Andersons were back in London having left Taiwan in 1963. In the mid 1970s she moved from teaching to community work, first with Ghanaians and then with the Chinese community. 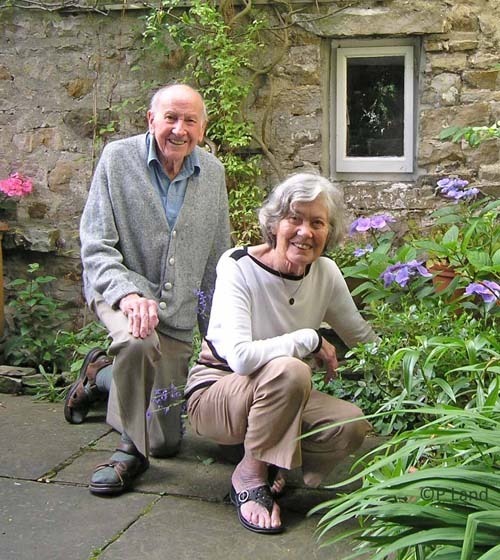 They bought the cottage in Aysgarth in 1969 and the friendships they developed there and in London helped them through the devastating loss of their son, Robin, in a drowning accident in June 1976, aged 21. Mrs Anderson regularly played the organ at Aysgarth Methodist chapel until forced to stop due to ill health. They enjoyed making music both together and with friends. She also loved walking in the dales and continued her hobbies of collecting fossils and stones and gardening. In her 70s she successfully took up photography. At the funeral those who described her life and her warm generosity which won her so many friends were her sister, Alison Smith, and her daughter, Jane. Two of her poems (from her book Sad, Mad, Good, Bad published in 1999) were read by her grandchildren, Rosa and Reuben. The Rev Malcolm Smith officiated and read the Bible readings. Dr Anderson was secretary of the Overseas Mission Committee of the Presbyterian church of England from 1964 to 1983, and then secretary of the World Church and Mission Department of the United Reformed Church from 1972 to 1983. In 1972 he wrote The Future of Taiwan; and in 1994 he edited Shoki Coe’s Recollections and Reflections. Clare wrote Taiwanese Voice in 1980 to provide information in English about the Kao-hsiung Incident (the ‘Formosa Incident’) in December 1979. This was published by the British Council of Churches under her pseudonym of Anne Ming. In England both worked closely with the “Taiwanese Christians for Self-Determination” movement. 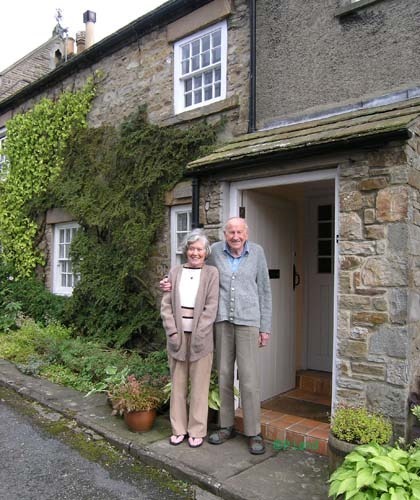 Below: The Andersons outside their home in Aysgarth. Boris enjoyed telling the story about a local man visiting them soon after they bought the cottage who told them that it was the worst dwelling in the village. They turned it into a cosy, friendly home. I have known Boris for over 40 years, he was a very nice man, and it truly was a pleasure to have known him. Boris was a lovely neigbour, always interesting to talk to and a great character. He will be sadly missed. Boris and Clare treated me like one of their children! I was fed so many meals at their home! Boris officiated at my wedding on Feb. 3, 1959. They both taught me to love New Testament Greek and I was honored to succeed their teaching positions at Tainan Theological College and Seminary after they left Taiwan and returned to the UK in 1963! They came to visit my family in mid 1970’s in New Jersey, USA and stayed for a night in our home! The last letter he wrote me was in 2009! I was so happy to welcome their daughter Jane and her family to our house in Taiwan 2 years ago!